Aggregate of octahedral crystals some of them showing very small faces of the cube. 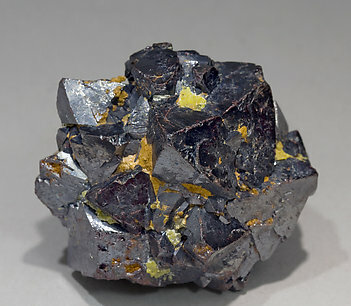 The crystals, with very well defined faces and edges, are coated in some areas by lemon yellow crystals, isolated or clustered, of Miersite, a rare iodide of silver and copper. A novelty at Sainte-Marie-aux-Mines 2015. Cubic Miersite crystals, one of them clearly dominant. 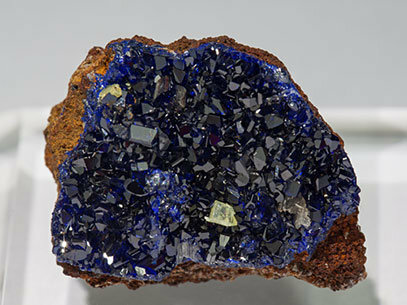 The crystals are very sharp, transparent, with a greenish-yellow color and they are implanted on an aggregate of very bright Azurite crystals on a rocky matrix. To our knowledge this association hasn’t been found before at Rubtsovskoye. 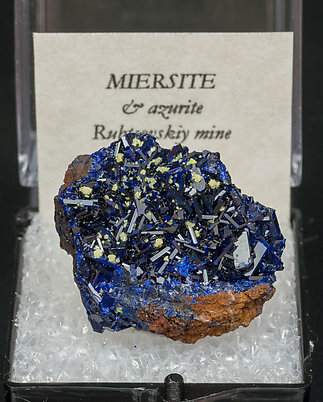 A novelty at Sainte-Marie-aux-Mines 2015. 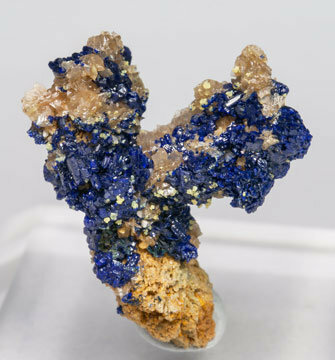 Spheroidal aggregates of small cubic Miersite crystals, with a greenish-yellow color, spread on an aggregate of Azurite crystals, with small twinned Cerussite crystals. To our knowledge this association hasn’t been found before at Rubtsovskoye. 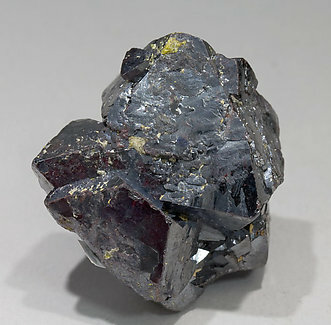 A novelty at Sainte-Marie-aux-Mines 2015. 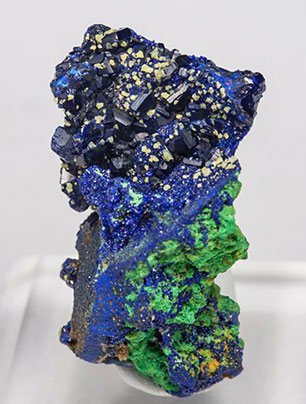 Spheroidal aggregates of small cubic Miersite crystals, with a greenish-yellow color, spread on a nodule of Azurite crystals on matrix with small Malachite crystals. To our knowledge this association hasn’t been found before at Rubtsovskoye.